When coal processing plants are far from the mine, overland coal conveyors can be used to connect the two. 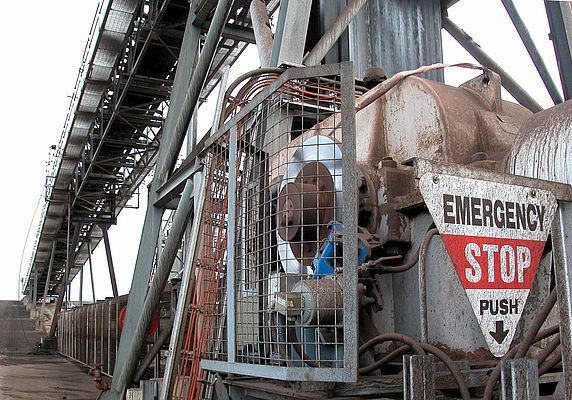 Disc brakes meet the requirements of these conveyors in normal stopping and parking operations, as well as providing vital emergency stop operation. When coal processing plants are an appreciable distance from the mine, how best to transport the coal from one to the other is a key consideration. It is not unusual for the processing plant to be tens of miles away, which might at first glance suggest delivery by truck. But overland conveyors can often provide a far more economical solution, providing cost reductions in the order of 20-40% or more. Of course with a conveyor that may run for miles, there are many design considerations to take into account; all of which will impact on long term reliability, availability and maintenance requirements. Transporting vast tonnages of coal overland, particularly where there are inclines involved, requires the highest levels of expertise in sophisticated conveyor and control systems. One of the most important design considerations is the braking technology to be employed. Twiflex provides reliable control for demanding materials handling applications, offering a large range of industrial disc brakes. 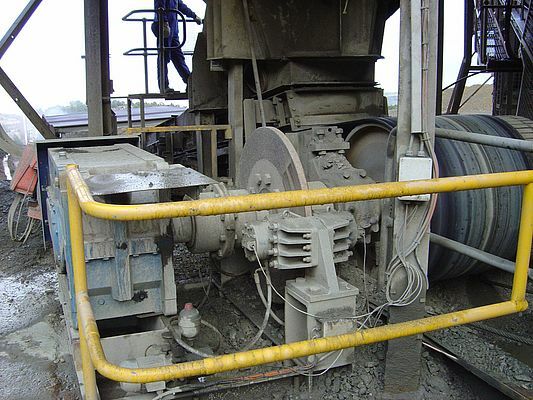 Disc brakes meet the requirements of overland coal conveyors in several areas. As well as being the ideal technology for normal stopping and parking operations, they also provide vital emergency stop operation. They are the ideal choice where one conveyor feeds another and there is a risk of spill – for example where the conveyor from a crusher at the mine feeds the overland conveyor to the processing plant. 'Power Off' braking systems operate the brakes with powerful springs, applying force to compress the brake pads against the disc. To release the brakes the springs are compressed by a retraction device, which in overland conveyor applications will typically be hydraulically actuated. Any failure in the supply to the retraction device would cause the springs to be released, so providing 'Power Off' braking. 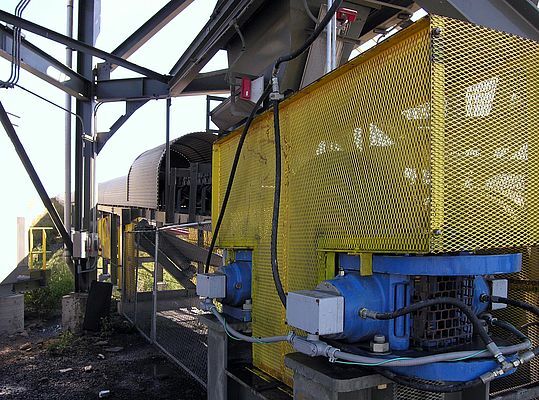 The braking systems are used on overland coal conveyors across the globe, but some of the most demanding of these are installed in the USA. One example is a conveyor transporting 165 tons of coal per hour on a 5° incline. Here, two spring applied, hydraulically released VKSD type disc brakes are used. The VKSD is part of Twiflex's modular series and is a standard two-module design, with the brake provided as standard with two pre-fitted brake pads. The brakes were supplied complete with an electro-hydraulic power pack with provision for variable deceleration control. As an example of a longer conveyor, Bucim mine, Macedonia, has an installation that runs to 2.7km long, transporting 5181 tons per hour. The two VKSD disc brakes were supplied complete with an electro-hydraulic power pack with the provision for soft braking. In a more demanding installation, VKSD disc brakes are used to provide braking power to an overland coal conveyor for Bowie Resources, Colorado. The conveyor carries a payload of 1500 tons per hour along a 840m conveyor with a 13.25° decline. At an installation for Mulzer Crushed Stone, Indiana, an overland conveyor carries 1100 tons per hour over 87m with a 5° incline. Here Twiflex recommended the MXSH series disc brakes, which feature a patented, compliant link mechanism to ensure uniform pad wear. The supplied LC electro-hydraulic power pack offered provision for fast approach and variable deceleration control. LC power packs provide a range of standalone units with options for soft braking, a range of operating and motor voltages, and various add-on accessories including a terminal box. On an installation for Cripple Creek and Victor Gold, Colorado, Twiflex recommended a GMRSH type disc brake. Here the brakes were supplied with a MP electro-hydraulic power pack with provision for fast approach and deceleration control. MP series power packs have been designed to provide an advanced and flexible means of brake control and to operate under the most arduous conditions where the environment is extreme but reliable operation all year round is paramount. There are many other examples from around the world where Twiflex disc brakes are providing reliable and effective braking on overland coal conveyors, in some of the most demanding environmental conditions imaginable. Companies across the globe rely on Twiflex brakes to protect vital coal transportation lifelines between mining and processing installations that can represent investments of hundreds of millions of dollars.